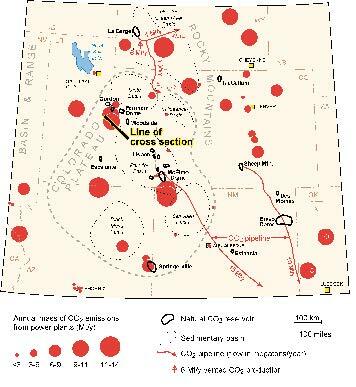 Map shows the major occurrences of known gas fields having high concentrations of CO2. Red dots are the point sources of CO2 emissions from power plants with dots sized according to the amount of annual CO2 emissions (in million metric tons). The line of cross section is the location of the modeling profile shown in the accompanying figure. Last year the President announced a “Global Climate Change Initiative” goal of reducing the nation’s greenhouse gas intensity by 18% between 2002 and 2012. The greenhouse gas intensity is the ratio of total annual greenhouse gas emissions (mostly carbon dioxide [CO2], plus methane, nitrous oxide, and other gases) divided by the gross domestic product. This ratio is considered to be an indicator of the reduction in gas emissions that can occur without affecting economic growth. The underlying philosophy is that stimulating and applying the technologies required for stabilizing and ultimately reducing greenhouse gas concentrations is best achieved by sustained economic growth. Between 1990 and 2000 the U.S. reduced its greenhouse gas intensity by 12%, so the target for the next decade is a challenging one. A growing priority for the Department of Energy (DOE) is the development of technologies that will assist carbon sequestration, including carbon capture, separation and storage, and reuse (“sequestration” implies the long-term storage of CO2). For the past three years the Utah Geological Survey, together with colleagues from the Energy and Geoscience Institute (University of Utah), and Industrial Research Limited (New Zealand), have been involved in a carbon sequestration project supported by the DOE. This project investigates the probable fate of CO2 if it can be economically separated from power plant flue gases and injected beneath the Colorado Plateau. A critical issue is how long it will remain trapped in the subsurface. Effective sequestration requires a time scale of about 1,000 years without significant leakage back to the surface. The Colorado Plateau has several factors that make it attractive as a possible sequestration region. It has broad, relatively simple, geologic structures with proven reservoir-seal rock layers and potentially large storage capacity; many nearby large coal-fired power plants that represent major point sources of CO2 emissions suitable for capture and separation; and natural CO2 fields that prove it is possible to store the gas in the subsurface on a geological time scale (see map above; Mt/y is the flux of CO2 in units of million tons per year). It also contains two pipeline networks that transport CO2 from several of these natural fields to enhanced oil recovery projects in southern Wyoming, western Colorado, and west Texas. Power plants in the region presently emit over 100 million tons per year of CO2 to the atmosphere, and there is an additional 30 million tons per year of production from the natural CO2 fields. This amounts to roughly half the total CO2 emissions in the region. Our study of the natural CO2 fields shows they are similar to conventional natural gas fields, with gas trapped in dome-like structures. The most common reservoir lithologies are sandstone and dolomite, with mudstone, shale, and anhydrite being the most common sealing rocks. The horizontal dimensions of the gas reservoirs (~ 10 kilometers or 6 miles) are typically 100 times larger than the thickness. Stacked CO2 reservoirs (or occurrences) are not uncommon, indicating that gas has migrated up through the rock section. In the CO2 fields where petrological and geochemical work on rock and fluids has been possible (some central Utah fields and Springerville field, southeast Arizona), the present-day fluids are supersaturated in dolomite and calcite. At Springerville, the influx of CO2 appears to have caused early precipitation of dawsonite (sodium-aluminum-carbonate). These CO2 fields indicate that natural, long-term storage of carbon has occurred as precipitated carbonate minerals (mineral trapping) as well as by hydrodynamic trapping of gas and dissolved CO2 in the pore water. Modeling of the fate of injected CO2 has been carried out using a computer program that considers both the twophase behavior of CO2 and fluid-rock reactions. The models have been applied to cross sections through typical geologic structures of central Utah, incorporating the mineralogy and physical properties of the units (for example, permeability, porosity, mineral thermodynamics, and capillary pressure functions for seal rocks) in the sedimentary sections. An important finding of the modeling is that structural traps are not essential for sequestration of the CO2, as shown in the adjacent figure, and all three trapping mechanisms (as solid, liquid, and gas) are important. In the model shown here, CO2 has been injected into the White Rim Sandstone at about 1 kilometer (0.6 mi) depth for 30 years and at a rate equivalent to that emitted by a 500 megawatt, coal-fired power plant. Although there is a regional dip to the section and the CO2 gas tends to move up-dip (to the east) as well as up-section with time, after 1,000 years 70 percent of the injected CO2 remains trapped subsurface. The colors show the fraction of gas in the pores (gas saturation). The modeling suggests that there is ample storage in geologic structures beneath the Colorado Plateau, but a critical factor is whether the reactions that precipitate CO2 have time to occur. These reactions typically require time scales of hundreds of years, so subsurface trapping for at least 500 years is essential. If major, high-permeability faults are present then loss of CO2 to the surface could make the injection site unsuitable for CO2 sequestration. Preliminary findings from this work have been presented at the 1st and 2nd National Conferences on Carbon Sequestration in Washington, DC (2001 and 2003), and are available on the UGS website at http://geology.utah.gov/emp/co2sequest/index.htm. • Natural CO2 Reservoirs on the Colorado Plateau and Southern Rocky Mountains: Candidates for CO2 Sequestration. Allis, R., White, S., Chidsey, T., Gwynn, W., Morgan, C., Adams, M., Moore, J.: Proceedings of the First National Conference on Carbon Sequestration, Washington DC, May 2001. 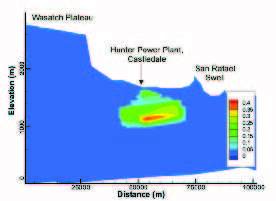 • CO2 injection potential beneath large power plants in the Colorado Plateau-Southern Rocky Mountain region, USA. Allis, R.G., Chidsey, T.C., Morgan, C., Moore, J. and White, S. P.: Proceedings of the 2nd National Conference on Carbon Sequestration, Washington DC, May 2003. • Investigations of CO2 mobility in natural reservoirs beneath the Colorado Plateau and Southern Rocky Mountains. Moore, J.N. Allis, R.G., Lutz, S., Adams, M.: Proceedings of the 2nd National Conference on Carbon Sequestration, Washington DC, May 2003. • Injection of CO2 into an Unconfined Aquifer Located beneath the Colorado Plateau, Central Utah, USA. White, S.P., Allis, R.G., Moore, J.N., Chidsey, T.C., Morgan, C., Gwynn, W., Adams, M.: Proceedings of the 2nd National Conference on Carbon Sequestration, Washington DC, May 2003.